Sparkle Fresh denture adhesive cream is formulated to provide secure retention of dentures. Control tip makes applying denture adhesive easier with more control and less ooze. 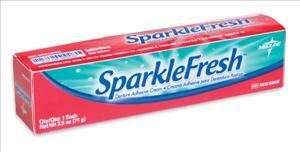 Sparkle Fresh, 2.4 oz.